The housing development at Great Western Park allowed archaeologists to explore in detail a vast area of landscape. 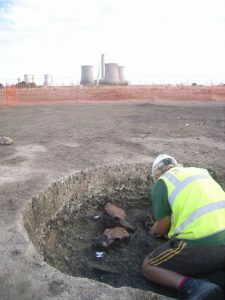 This revealed significant discoveries from virtually every period, allowing for the reconstruction of the various ways in which the inhabitants of Didcot have lived over the last 10,000 years. The evidence is in many respects representative of changes that can be seen over much of southern Britain. This talk will introduce the prehistoric discoveries made at Great Western Park and discuss how they help us understand the lives of our ancestors. A selection of artefacts found at Great Western Park will also be on display. Alex Davies obtained his PhD in 2016 on Late Bronze Age and Iron Age settlement and society in the Thames Valley. He has since worked in post-excavation at Oxford Archaeology, primarily analysing and writing up prehistoric excavations and pottery. He is interested in all aspects of British and European prehistory, and the use of ethnography in the interpretation of prehistoric society. Shops and Pubs We were overwhelmed by the attendance at our talk on 27th March and are hoping to repeat it for those who had to be turned away. We are immensely grateful to the local families and individuals who have helped us with this project. Meanwhile, come on our guided tour at the Festival on 6th or 11th May. We are hosting Paul Booth’s talk on the Dorchester Dig on 8th May. The new season begins on 25th September, when Mark Davies will give a talk entitled ‘Professors of Rowing: the first Oxford v Cambridge boat races’.